About a month ago, we were thrilled to announce that TeamSnap reached 10 million customers worldwide. Thanks again for making it possible! To celebrate, we asked you to share your favorite TeamSnap story with us. It could’ve been a moment you wouldn’t have survived without TeamSnap or a story about how TeamSnap changed your life or how TeamSnap Live! helped you experience your child’s winning catch even though you couldn’t be at the game. With so many amazing submissions, it was tough to choose our favorite. The voting was close, but one story came out on top. 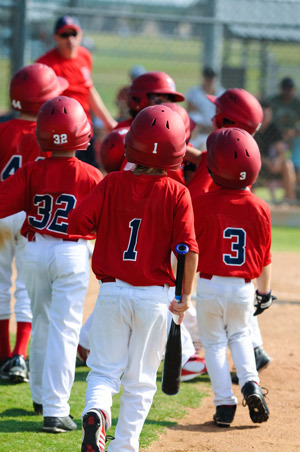 This amazing TeamSnap customer story is from Manuel Recio, coach of the Cobras, an 8U coach-pitch baseball team from Miami that’s been using TeamSnap for over a year. Enjoy! “Last year we were playing for the first-place seed going into the playoffs. All my parents were really into each and every game. One dad, Guillermo, travels on a regular basis, so he schedules his business trips around our games. On this particular day, Guillermo had a business trip to the Dominican Republic. He was going to fly out that morning to see his son play for the first-place ranking in our division. The game was scheduled to begin at 7 p.m. However, his flight was delayed, leaving Guillermo stuck at the airport with a bunch of strangers. Just as they started to board the plane, there was another delay. Everyone was stuck on the plane waiting to get the greenlight to fly back to Miami. Guillermo was obviously not going to make the game. However, thanks to TeamSnap, he was able to receive live scoring updates. Every parent in the stands provided details to Guillermo about the game. The score was really close, and Guillermo provided the details to all the passengers that were sitting on the plane with him. Everyone started asking for updates and became interested in a game that was being played in another country. Guillermo continued updating the passengers, who now could care less about the delay. It was a close game throughout, but in the last inning, one of our boys got the game-winning hit! Everyone on the plane erupted in cheers. Guillermo received high fives from several passengers and a ‘Go Cobras!’ chant began on the plane. It’s amazing how TeamSnap played such a role in so many lives that day. But most importantly, Guillermo was able to live the excitement of his son’s game from a delayed plane with strangers in another country!